Rudy and Mickey getting along again! Sister Mia playing the role of Switzerland. Whether you are a life-long cat parent or a first-time cat parent, whether you have one cat or several, Ingrid Johnson can assist with any behavioral challenges a family may have. We'd recommend Ingrid to anyone! She is thorough, knowledgeable, patient and kind, and Ingrid truly cares about the cats and owners. Ingrid can assess anyone's situation and home environment, and make great recommendations for you and your cats. She made recommendations for us based upon our situation and it was helpful and made a true difference. Since we live in Oklahoma, our consultation was through both phone and email. 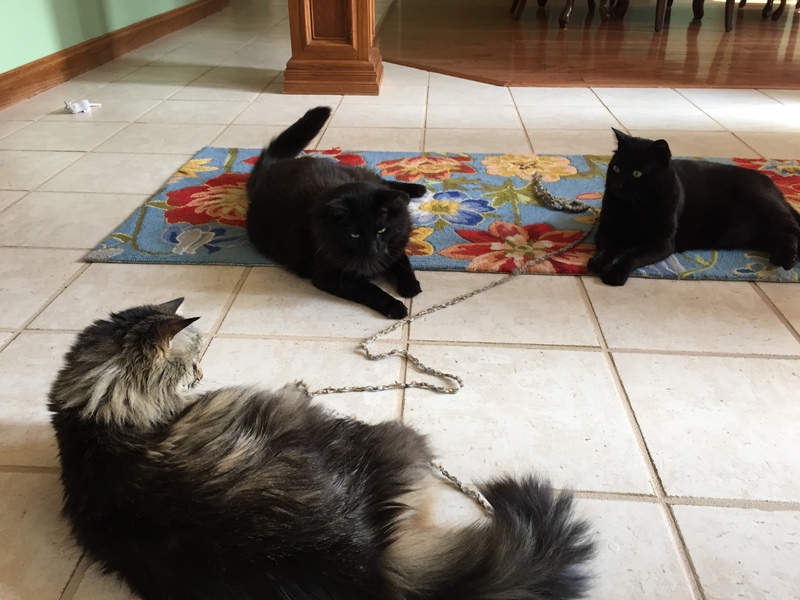 We are a military family with three cats: Rudy, Mickey and Mia. I've had cats most of my life and am interested in cat behavior. Even though I am knowledgeable about some things, there is much I have yet to learn, and when we began having challenges and needed help, I didn't hesitate to contact Ingrid. She has years of solid experience both from a behavioral and medical standpoint. 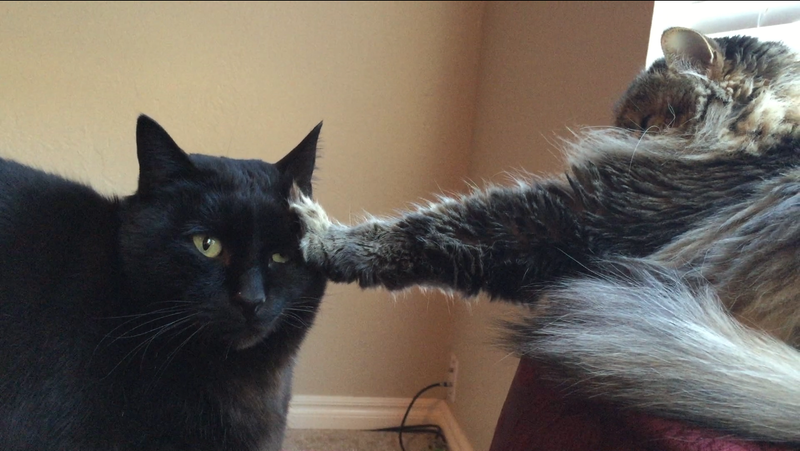 Our three cats got along together for four years. We had a happy, harmonious household for the most part. After our military move in 2015, we began having challenges several months after the move. Rudy, our seven year old male, began having redirected aggression towards Mickey, our five year old male. He would hiss at Mickey and the hissing got increasingly more frequent. They had always been buddies! Meanwhile, Mickey got a leg scratch and required antibiotics. He was also put in a cone. Though we followed all instructions, his leg didn't heal. Because he was stressed by both the cone and Rudy's hissing, he began compulsively licking his leg each time his cone came off so he could eat, drink, groom etc. It would get red and inflamed and he required lots of supervision. After two months in a cone, and after he suddenly developed a urinary issue, I immediately switched vets to get a second opinion and to get Mickey healed. 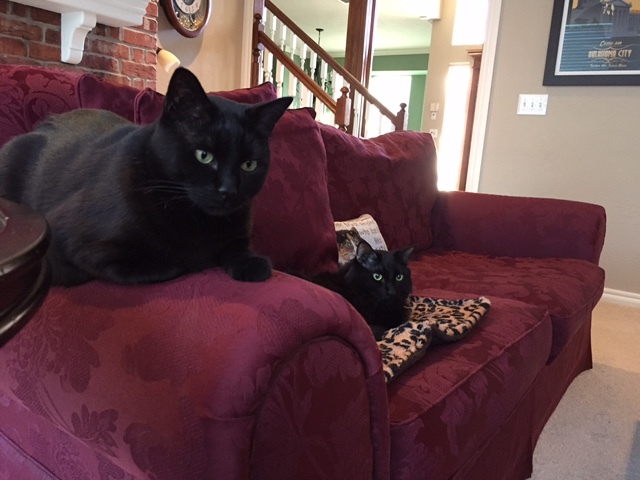 Simultaneously, my husband deployed, and I knew I needed help with our cats both from a behavioral and medical standpoint. I did not want things to progress. Though it was around Thanksgiving and Ingrid was extremely busy, she still worked me in as a client. Over the next eight weeks we corresponded via phone and email. She assessed medical records and got a full picture of our problem. Then she made great recommendations for me to follow. She even recommended a specific steroid medication for me to mention to our new vet to assist Mickey. The vet agreed and it helped him, along with a behavioral medication to assist in stopping the licking. 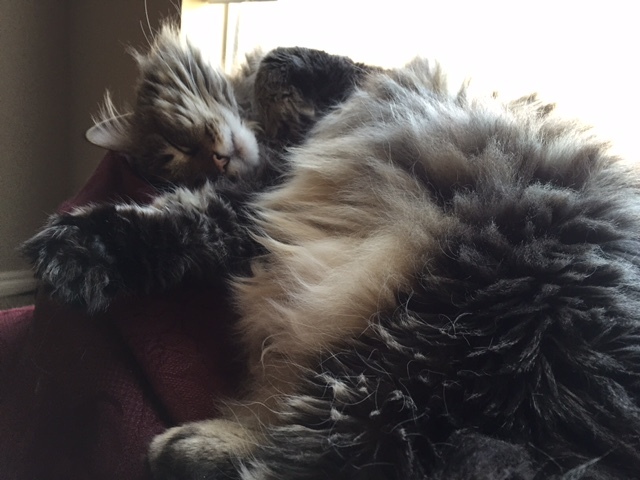 For four months it was extremely stressful in our household, but the last two of those months, with Ingrid and our new veterinarian, things began to turn around. A combination of following our vet’s instructions, plus the advice of Ingrid, led to positive results!! Ingrid recommended several things, among them separating Rudy and Mickey for several weeks for a "reintroduction," and so Mickey could heal. 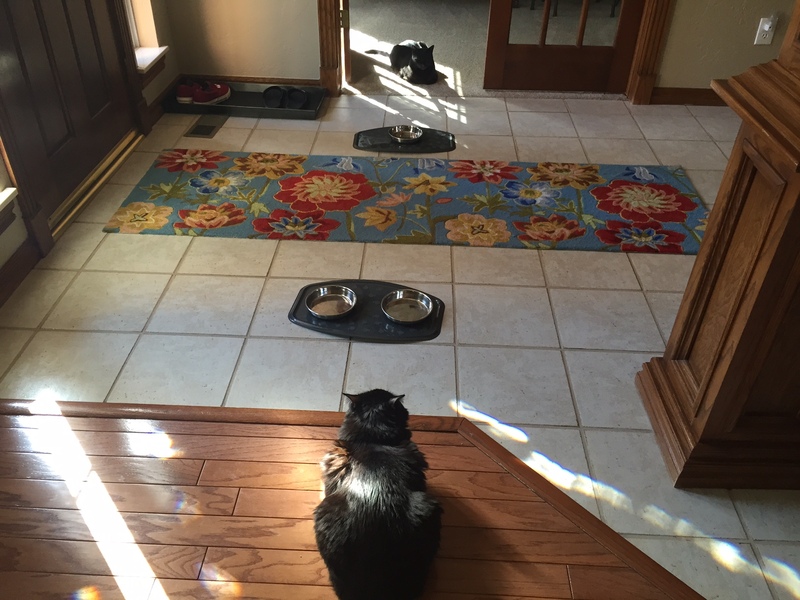 She assessed their diet and made great recommendations on foods that would be ideally suited for our cats. She also suggested great environmental enrichment ideas. Ingrid was very helpful in all aspects and we're appreciative. Because we were so invested in getting things "back-to-normal" again, we decided to purchase several quality toys from Ingrid, a few foraging toys, the clear litter boxes Ingrid uses for her cats, and a cat scoop tree. 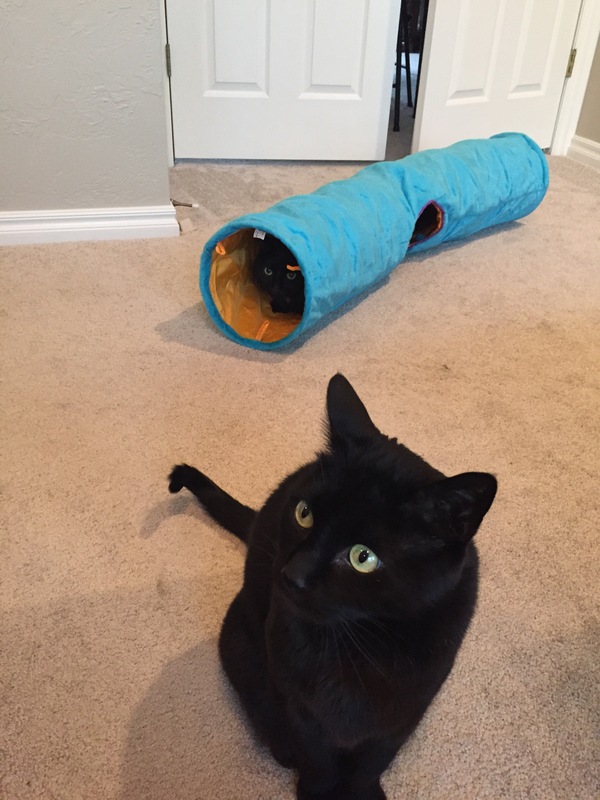 We already have toys and a cat tree, but we wanted to offer additional enrichment for our cats throughout our home. Today, Rudy, Mickey and Mia are together again and our household is much more harmonious. Following Ingrid's advice plus the advice of our vet has paid off. We love our cats dearly and would not hesitate to call Ingrid in the future if needed. 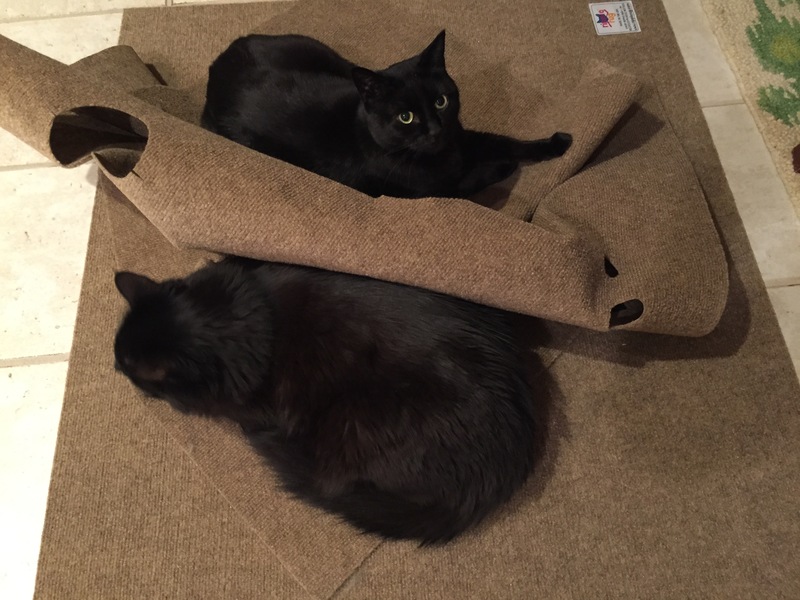 Sharing their new Ripple Rug. All three playing with Cat Fisher toy by FF. Sister Mia keeping the boys in line! 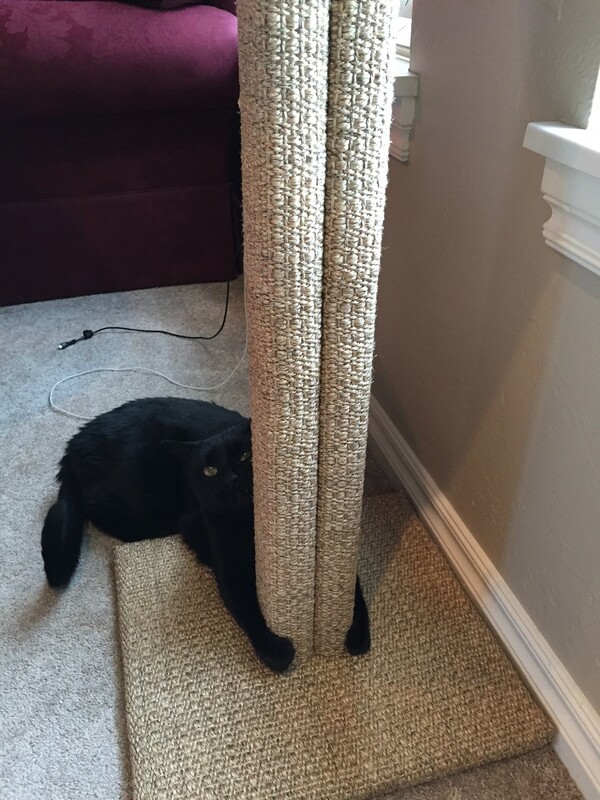 Rudy hugging his new scratching post by Fundamentally Feline.